Finally. A kayak paddle to end all kayak paddles. The Deso kayak paddle from Cataract Oars. With a full filament wound carbon fiber shaft. Injection molded urethane grips. Customized offsets. Rocket science birthed this kayak paddle. Or aerospace science, at least. Because the Deso kayak paddle is made with the same aerospace technologies and materials as our other oars and paddles, it’s tough. Extremely tough. 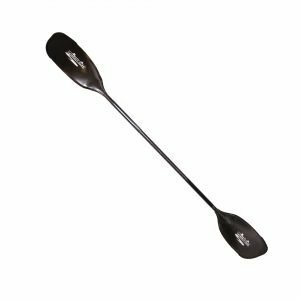 Its filament wound crosswoven shaft and carbon fiber molded blade offer incredible resistance to deformation as you move buckets of whitewater with each swoop of the paddle. Our engineers have designed the blades of the Deso paddle with a lightweight foam core surrounded by compression molded high-grade carbon fiber with optimized fiber orientation for maximum possible strength-to-weight ratio. Deso Kayak Paddle and Desolation Canyon. The Desolation Canyon stretch of the Green River—Deso, for short—is a Utah kayaking and rafting destination and a favorite whitewater stretch for many of us here at Cataract Oars. Thus the name of our kayak paddle. In the spirit of its namesake, the Deso kayak paddle embodies simplicity and wildness. This work of precise engineering is never more at home than when encountering the elemental forces of nature. Feeling fearless and seeking a thrill? The Deso will take you places most other paddles fear to consider even going.